Extremely low space availabilities in the small-cap CRE space have electrified rents to the delight of small-time investors. Since 2006 the average annual increase in industrial rents, for example, was a modest 1.5%. 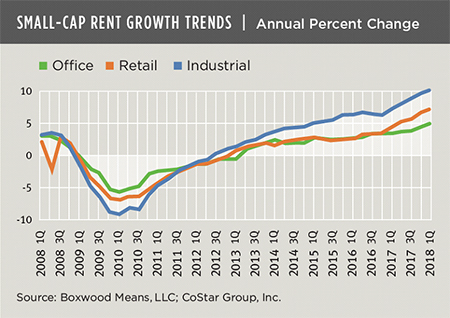 Yet small-cap industrial rents have consistently exceeded 2% rent growth in each of the last five quarters, soaring an extraordinary 2.9% over three months ending this past March. Strong U.S. industrial production and growing e-commerce activity - complemented by consistent job growth in manufacturing and warehousing/transportation jobs - have placed all types of manufacturing, light industrial and warehouse space at a rent premium. Based on small-cap CRE data supplied by Costar, industrial rents have shot up 9.9% over 12 months to 14.1% above the pre-recession peak. Workforce shifts and efficiency initiatives have imposed some pressure on office demand but, nonetheless, small-cap office rents are killing it. Rents rose 1.5% during Q1 and 4.7% YOY with both percentage increases representing new highs. And despite the controversies over the sustainability of retail as we know it, rents for small retail centers, free-standing stores and general retail also hit a new apex with unparalleled quarterly and annual growth of 2.2% and 7.0%, respectively. Small-cap retail rents are now 3.0% above their pre-recession high. See the nearby graph for these rent growth trends. Equally remarkable - and the proximate cause for the unprecedented rent growth - are prevailing small-cap vacancy rates. At a figure chained below 5% for the seventh quarter in a row, the aggregate national vacancy rate of 4.4% is seemingly suspended in time at record-low levels. All three main property types have achieved record low vacancies: Industrial at 3.4% and perched 260 bps below the previous cyclical low; Retail at 4.3% and comfortably 150 bps beneath its previous nadir; and Office, at 6.7%, unchanged for four quarters and 140 bps below its former low before the Great Recession. First quarter findings did include some areas of concern: most noteworthy, a growing weakness in space demand as the velocity of occupancy gains across the three sectors tumbled 27% YOY. That being said, strong U.S. economic growth against the backdrop of extremely low new supply will likely keep this year's vacancy rates near record lows and, not surprisingly, small-balance lenders and investors jubilant.